In our previous article, “Survive,” we laid out the case that when a financial organization’s survival is at stake, surgical cost-cutting is the best of the least-desirable approaches. 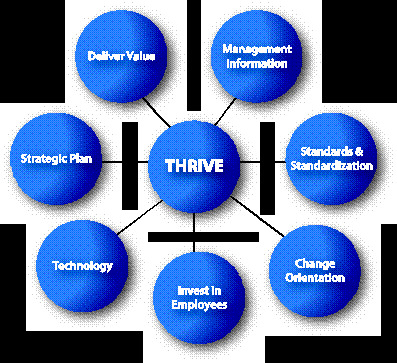 This article highlights seven critical areas for surviving organizations to focus on in order to thrive. In each of these areas, there are multiple examples where companies made significant changes to improve their performance. First, get everyone on the same page. This starts with a strategic plan that is followed with the development of performance goals for corporate units, key individuals, and employee groups. This cascading of goal responsibility is reinforced with clear and repetitive communications to shareholders, managers, and employees. Next, make sure the organization is delivering value, both to customers and shareholders. To do this, the organization must be customer focused and profit oriented. There are two classic ways to stay customer focused: use feedback mechanisms and have senior management work front-line jobs from time to time. Additionally, the organization needs to constantly ensure that they have their ACCT (accuracy, courtesy, cost, timeliness) together.Finally, the occasional question needs to be asked: “Is old still valued and profitable?” Dead wood can still light a new fire. To assist in delivering value and ensuring profitability, management information systems need to be in place. These systems need to deliver critical micro and macro information in a timely way and be flexible enough to produce one-off reports. Knowing when and where performance is sagging and excelling is critical to success. Improving the sagging performance and duplicating the excelling performance are two of the best ways to improve overall company performance. Coupled with goals and management information systems is the need for standards and standardization. Operating standards need to be in place and understood by all employees, whose success is critically dependent on knowing the correct procedure. Within the standards arena, a formal process is needed to keep the constantly evolving standards and operating procedures current. Next, the organization needs to be change oriented. Organizations need to be aware of trends and dead-ends by being organized for improvement. In other words, making change happen is not “everyone’s responsibility.” Bringing change into an organization is the specific, direct responsibility of senior management. Senior management can then task one or more groups within the company to be the change agents. Many times these groups are assisted by others outside the organization. Ideas for change are numerous—developing, selecting, and prioritizing what to change is difficult—and implementation is complex and sometimes thankless. But change is an organizational must and must be specifically focused upon. Investing in employees is also critical to thriving. Ensuring that employees are trained to deliver value and are rewarded for strong performance is all part of a successful organization. The training (both formal and on-the-job) must ensure that everyone knows how to do their job in both the specifics and generalities of their responsibilities. Along with the training, objective feedback mechanisms will keep employees aware of their performance. This feedback provides both motivation and accountability to keep employees on the task of delivering value to customers—internal and external. Today’s financial organization cannot be successful without a strong technology framework. One common misstep is failing to understand when the timing is right to move to new technology. Existing and new technologies alike need to be appropriate, effective, and cost efficient. Sometimes manual workarounds are better than expensive new systems; however, all systems need to be easy for the end-user to operate. Additionally, the systems need to be reviewed to ensure that embedded functions are being fully utilized. More often than not, valuable functionality is neglected.